Source: Huitt, W. (1998). The workplace and the transition to the information age: How it impacts and is impacted by women. Paper presented at the Third Annual Women's Studies Conference, Valdosta, Georgia, March 5-7. Naisbitt and Aburdene (1982, 1990, 1990) and Toffler and Toffler (1970, 1981, 1990, 1995) provide abundant evidence for one of the most important trends affecting human history--the movement from the agricultural and industrial ages of the 19th and early 20th centuries to the information/technology age into which we are rapidly moving. Baker (1992) describes this as a paradigm shift that is profoundly altering the rules of success. These and other writers have documented subsequent trends that are having an impact on our daily lives (e.g., Bridges, 1994; Dent, 1995; Popcorn, 1992; Popcorn & Marigold, 1998; Rifkin, 1995). While much focus has been paid to how these trends apply in general, relatively less attention has been paid to how these changes are impacting women and how the feminine voice can assist in the transition. The purpose of this paper is to provide an overview of these trends and to highlight an area of most significance to women. 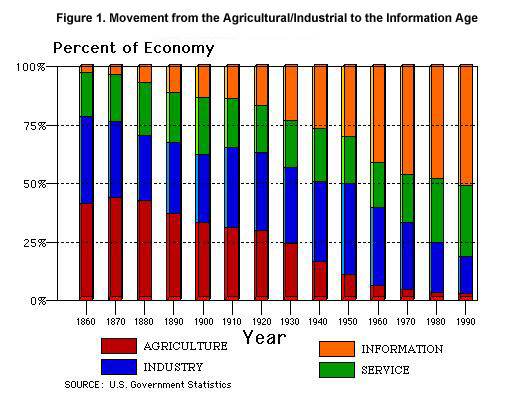 The movement from the agricultural/industrial ages to the information age is shown dramatically in Figure 1. In 1870, approximately 70% of the workforce were connected to the areas of agriculture and manufacturing. By 1990 the situation was reversed with over 70% involved in the information and service sectors of the economy. The projections are that agriculture and manufacturing will comprise less than 13% of the workforce by the turn of the century (Toffler & Toffler, 1995). Pilzer (1990) points out that change, especially technological change, has been a fact of life throughout human history. What makes this transition completely different is the speed with which the change is taking place. Burris (1997) provides data on the reduction in the amount of time it takes to get a new technology into production in the 100-year period from 1850 to 1950 (see Table 1). Change that took place in 50 or 60 years is now taking place in 10 years or less. *Source: Burris, D. with R. Gittines. (1997). Technotrends: How to use technology to go beyond your competition. New York: HarperBusiness. Pilzer (1990) supplies two more examples from the last two decades that emphasize the speed of change. In the early 1970s, the carburetor was one of the most important components of automobile engines. The manufacturing and repair of carburetors accounted for thousands of jobs. Just 10 years later, the carburetor was obsolete, completely replaced by fuel injectors that allowed the fuel efficiency of most cars to double. This was a major factor in revising estimates for the timeframe of the depletion of the worlds petroleum supply from less than 40 years to almost 100 years. A second example involves the music industry. In the early 1980s, vinyl records accounted for the majority of album sales. Most were manufactured in Ohio with thousands of people employed directly and indirectly. Just five years later vinyl records were almost completely replaced by CDs. Since CDs were manufactured mainly in southern California, whole communities were quickly and severely impacted. The major point of these examples is that the speed of change is completely different from anything our ancestors experienced. If we hope not to be overwhelmed by these trends, if we are to take advantage of them, we must take action quickly and be prepared to advance in new directions. This is especially true for women, and I might add, minorities; these groups historically are the first groups to suffer from change in the workplace and the last to reap its benefits (McCorduck & Ramsey, 1996). The first step in becoming successful in the new environment is to attain knowledge of the trends; the second is to make the necessary adjustments. The next section of the paper will describe some of the most important trends impacting women. The last section will make some recommendations on how to respond. In addition to the change to an information age with its subsequent increase in the speed of change, there are a variety of trends that are impacting our lives. These are shown in Table 2 and discussed in some detail by Huitt (1995, 1997). In this paper, I will focus on a significant trend impacting women: the transformation of the workplace. The changes occurring in the workplace present several subtrends. One of the most significant is that women are returning to it in large numbers. I use the term returning rather than entering because women comprised a major factor in the workforce during World War II, but were forced out by men returning from the war. Jamieson and OMara (1991) project that approximately 50% of the workforce will be comprised of women by the year 2000; over 85% of working-age women will be in the workforce. Dual-career families, comprising 55% of all families in the late 1980s, will increase to 75%. A similar percent of school-age children will have mothers in the workforce, a dramatic increase from the 39% in 1970. From 1973 to 1994, Americas real per capita GDP [Gross Domestic Product] rose 33%, yet hourly wages fell 14% and real weekly wages 19% for nonsupervisory workers (those males and females who do not boss anyone else). By the end of 1994 real wages were back to where they had been in the late 1950s. With current trends, by the turn of the century real wages will be below where they were in 1950 (p. 24). Table 3 shows the changes in real wages and incomes for the period 1973 to 1992. While the real per capita GDP has risen in 18 of the past 20 years, real weekly wages have fallen persistently in 15 out of those same 20 years. The result is that in 1994 the top 20% of the income distribution earned 49.1% of all income with the bottom 20% earning just 3.6% (Bagby, 1996). Top to bottom inequalities rose by one-third during this period. *Source: Thurow, L. (1996). The future of capitalism: How today's economic forces shape tomorrow's world. New York: Penguin Books. In the decade of the 1980s, all of the gains in male earnings went to the top 20% of the workforce and an amazing 64% accrued to the top 1%. If incomes rather than earnings are examined, the top 1% gets even more--90% of total income gains...Female earnings followed male earnings with a ten- to fifteen-year lag. (p. 21). Because of the speed of change, those men who recognized and took advantage of the changes in the marketplace reaped tremendous benefits, while those who lagged behind only slightly lost ground. Table 3 also shows that wives came to the rescue of the family in the 1970s and 1980s. Even though male earnings dropped substantially for all but the top 20% of male workers, real household incomes fell only marginally for the bottom 60%, and increased for the top 40%. One third of this increase was a result of a 32% rise in female real annual earnings; however, two-thirds was due to women working more hours per year (Thurow, 1996). Unfortunately, most income earners in the family are now working as many hours as they can. With wages falling and no additional hours to work, real household incomes are expected to decrease during the next several decades. This is especially likely to impact single head of households, the majority of whom are women. Bagby (1996) reports that 52% of households with income less than $15,000 are headed by single mothers; this category is only 8% for middle income ($25,000 to $100,000) and 3% for wealthy (more than $100,000). With all the pressure on family incomes, there is a strong economic incentive for men to bail out of family relationships and responsibilities. Mens real standard of living rises 73% when they leave their families; the standard of living for the female head-of-household and her children left behind falls 42% (Thurow). This reentrance of women into the workforce is occurring during the transition from the industrial to the information age. To a large extent, women entering the workplace are immediately faced with the issue of how to adapt to the new workplace environment. Aburdene and Naisbitt (1992) describe some important differences in the structure and functioning of organizations in these two eras (see Table 4). As we look at the characteristics of organizations in the industrial-age (e.g., bureaucratic structure, focus on rank and control, mechanistic and impersonal) versus the characteristics of organizations in the information-age (e.g., network structure, focus on connections and knowledge exchange, holistic and personal), I do not think it takes too big a stretch to re-label these columns male and female, masculine and feminine, or at a minimum, masculine and androgynous. * Source: Aburdene, P., & Naisbitt, J. (1992). Megatrends for women. New York: Villard Books. Some evidence that the information age is more feminine in orientation comes from statistics on the percentage of women currently working in different occupations. In those areas more oriented to the information and service sectors, women have attained equity and in some cases have dominated certain occupations (see Table 5). For example, Jamieson & OMara (1991) report that in 1990 women represented 35% of the executive, administrative, and management workforce population in the United States. When considering the category of managers and professionals combined, the percentage increases to 47.8%. In the decade from 1975 to 1985, the number of women in this combined category increased by 77%, while the number of males in those roles increased by only 6%. Aburdene and Naisbitt (1992) project this trend to continue, culminating in women becoming CEOs of Fortune 500 companies in large numbers around 2010. In addition, women now hold over 10% of board seats in Fortune 500 companies. Of the top Fortune 100 companies, 97% have at least one woman director and 59% have multiple female directors (Brennan & Pospisil, 1997). When women are provided an opportunity to move into the management ranks, they perform quite well. Moskal (1997) summarizes findings from a study conducted since 1988 by the Foundation of Future Leadership. The study involved evaluations of effectiveness for more than 900 managers at major corporations. They found that "womens effectiveness as managers, leaders, and teammates outstrips the abilities of their male counterparts in 28 of 31 managerial skill areas--including the challenging areas of meeting deadlines, keeping productivity high, and generating new ideas" (p. 17). Women were especially competent at providing support in terms of guidance, follow-up, feedback, and providing help when needed. Men scored better in two areas: handling pressure and coping with their own frustrations (women are more likely to voice their frustrations, leading to lower scores in the area of managing self). Men and women were equal on the skill of delegating authority. These are impressive results, especially considering that over 70% of the individuals involved in the assessment process were male. Also of interest was that women consistently rated themselves lower than their male counterparts in each of the skill areas. However, many women are not waiting to become executives of major corporations; they are starting businesses of their own. Brown (1996) reports there are close to 8 million women-owned businesses in the US, generating $2.3 trillion in revenue. This is an increase of 236% over the last 9 years (Florence, 1997). Women own more than 30% of the 21 million businesses in the US (Gite & Baskerville, 1996), projected to approach 50% by the year 2000 (Florence). They employ over 18.5 million people, more than 26% of the workforce and more than all the Fortune 500 firms combined. Earnings for women-owned companies are rising twice as fast as the rate of all other companies. One of the keys to success in the information age is educational attainment. In terms of graduating from high school, women have been keeping up with the increased graduation rate for men for the past three decades. Approximately, 80% of both men and women hold high school degrees, up from 45% in the 1960s. 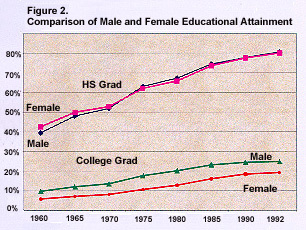 During this same period, women have been lagging behind men in graduating from college (see Figure 2). However, recent data are encouraging. Of women who graduated from high school in 1992, 65% enrolled in college the following fall, compared with 59% of men (Jacobs, 1996). In that same year, women represented 53% of enrolled college students. This is the culmination of steady increases during the during the 1970s and 1980s (Karen, 1991). By 1992, 59% of two-year degrees, 54% of bachelor's degrees, 52% of master's and professional degrees, and 37% of Ph.D. degrees were awarded to women (National Center for Educational Statistics, 1994). most of the widening dispersion among earnings is being produced within what are supposed to be homogeneous groups of workers. The central statistical fact is not widening earnings gaps between skilled and the unskilled or between the educated and the uneducated, but widening earnings gaps among the skilled, among the unskilled, among the uneducated, and among the educated. By age, 85% of the rise in inequality occurred among those of the same age rather than between those of different ages. By education level, 69% of the rise in inequality occurred among those with the same education, rather than between those of different education levels. By industry, 89% of the increase in inequality occurred among those in the same industry rather than between different industries (p. 25). These data challenge the rules of the industrial-age paradigm: pick the right industry or vocation, get a good education, and hang on--you will make more money as you gain experience. Rather, these data reflect a new paradigm--be prepared and take advantage of opportunities as they appear and be prepared to change courses to take advantage of new opportunities. This is an especially critical issue for women; the careers most readily open to them or which they normally select are also those at the bottom of the pay scale. There is one area where education makes a difference, however. Aburdene and Naisbitt (1992) report that "women who took more than eight college credits of math earned more than other women, as much as men in some occupations (accounting and engineering) and more than men in others (financial institutions and manufacturing)" (p. 76). Women are doing as well academically in the areas of science and math in high school in terms of grades, but do not score as well as boys on standardized tests such as the SAT (Karp & Shakeshaft, 1997). An important result is that girls are excluded from mathematically-oriented careers when selecting programs of study in college (Karp & Shakeshaft, 1997). This has devastating effects on life-long earnings. Ramos and Lambating (1996) suggest one reason for the discrepancy in test scores is that males are greater risk takers than girls when taking objective tests. Another factor may be that girls are significantly more field-dependent than boys (Witkin, Dyk, Faterson, Goodenough, & Karp, 1962; Witkin, Oltman, Raskin, & Karp (1971), relying more on contextual cues that are absent when taking traditional standardized tests. It is clear that with real incomes falling, women's involvement in the workplace is necessary for most families. If work is to meet women's needs, they need to be involved in economic and social development. They need to run their own businesses. They need to be involved in the training and development of the future workforce. They need to be involved in the highest levels of government and politics. They need to own media. They need to be presidents of universities, superintendents of schools. They need to be so thoroughly enmeshed in the fabric of decision making and policy that their voices are heard at every turn. With increased numbers of women in top management and business-ownership, we need to provide girls, as well as boys, the opportunity to be involved in programs like Junior Achievement so that they can interact with successful business people and begin to develop the skills necessary to run a business (Sperling, 1992; Van Scotter, Van Dusen & Worthen, 1996). We need to encourage girls and women to continue their increased involvement in sports because "playing and succeeding in sports changes women's perceptions of themselves as well as men's perceptions of them" (Aburdene & Naisbitt, p. 44). Prior to the Title IX legislation mandating equal funding for women sports (1972), only 2% of athletic budgets were for women; in 1991 that figure rose to 30% (Aburdene & Naisbitt, 1992). Increases in female participation have jumped dramatically. At the high school level, women accounted for 36% of athletes in 1991 (2 million girls, 3.4 million boys), up from just 7% of athletes in 1972. Similar increases have been seen at the collegiate level: 158,000 female athletes in 1991, up from just 16,000 in 1962 (Aburdene & Naisbitt). Another indicator of increased female involvement in sports is the increase in total U.S. sports bra sales which went from 25,000 units in 1977 to 42 million in 1996 (Fisher, 1997). As women seek equity with men in the professions, there are some caveats. Projecting from recent data that half the students in fields such as medicine, law, and psychology are women, Nicholson (1997) proposes that women will comprise the majority of the workforce in these and other professions such as religion, higher education, and nonprofit organization administration by the year 2020. However, these professions are being abandoned by men in favor of fields that offer more income opportunity such as finance and technology (McCorduck & Ramsey, 1996). Women are still underrepresented in these latter areas. If women do not want to pick up the economic crumbs left behind by men, they need to make the transitions now. One of the keys is to encourage young women to select careers that require more mathematics training and to encourage institutions of higher education to use high school grades as a primary predictor variable for womens success in mathematics- and science-related curriculums. However, as previously stated, it is not simply a matter of selecting the right industry or getting the right education. In an interview in Fortune Magazine, Tom Peters, renowned author and speaker states "What a person or a company will need in order to survive in the years ahead is a particular way of seeing. And that must include both the destruction of the old and the developing of the new" (Fisher, 1997, 274). The feminine way of seeing--relying more on establishing connections, accepting responsibility for caring and protecting self and others, seeking win-win solutions--is an important viewpoint for success in the information age. This viewpoint needs to be nurtured, in both men and women, if we as a nation and as a people are going to take advantage of the tremendous opportunities that present themselves in the near and upcoming future. In the last 25 years, weve convinced ourselves and a majority of the country that women can do what men can do. Now we have to convince the majority of the country--and ourselves--that men can do what women can do (p. 82). As we move from the agricultural/industrial age to the information age, increased emphasis is being placed on relationships, on empathy and care, on the spiritual and emotional aspects of their lives. Our nation, as well as the world, has been socializing women, who now comprise a major sector of the workforce, for these precise attitudes and skills (Gutierrez & Mayer, 1997). We need to listen carefully to what they have to say and allow women full participation in the decision making and transformational process. At the same time every individual needs to heed the advice of Tichey and Sherman (1993): "Take responsibility...either solve the problem yourself or accept a fate you may not like" (p. xxi). As much as women might like for men to take up the cause of equality or for society to continue to change in ways that lead to equal opportunity for women, that might not happen as rapidly as some women desire. Rather, every woman individually needs to take it upon herself to forge ahead, to muster the energy and drive necessary to attain excellence in the workplace, in political life, in religious organizations, in sports, in the arts, and all other areas of human endeavor. Group attainment is based on individual attainment, on the individual striving and growing and changing. Fortunately for all of us, individual women have demonstrated an ability to attain the highest levels of achievement. To the extent that a society and the world continues to move towards individual liberties and economic growth, women should continue to make giant strides on the road to equality. To the extent that economic growth declines or group norms based on obsolete ideals of womens place in the world are advocated, women will be the first to suffer. Bagby, M. (1996). Annual report of the United States of America: What every citizen should know about where each tax dollar goes and why. New York: HarperBusiness. Baker, J. (1992). Paradigm: The business of discovering the future. New York: HarperBusiness. Brennan, K., & Pospisil, V. (1997, February 12). Women break boardroom barrier. Industry Week, 12. Bridges, W. (1994). JobShift: How to prosper in a workplace without jobs. Reading, MA: Addison-Wesley. Brown, C. (1996, August). Theyve got the power. Black Enterprise, 27(41), 63-70. Burris, D. with R. Gittines. (1997). Technotrends: How to use technology to go beyond your competition. New York: HarperBusiness. Dent, H., Jr. (1995). Jobshock: Four new principles transforming our work and business. New York: St. Martin's Press. Fisher, A. (1997, December 29). Tom Peters, professional loudmouth. Fortune Magazine, 136(12), 273-276. Florence, M. (1997). The enterprising woman. New York: Warner Books. Gite, L., & Baskerville, D. (1996, August). Black women entrepreneurs on the rise. Black Enterprise, 27(41), 72-82. Gutierrez, G., & Mayer, E. (1997, May). 2020: The modern renaissance. The Futurist, 31(3), W5. Huitt, W. (1995). Success in the information age: A paradigm shift. Based on a background paper developed for a workshop presentation at the Georgia Independent School Association, Atlanta, Georgia, November 6, 1995. Huitt, W. (1997). The SCANS report revisited. Paper delivered at the Fifth Annual Gulf South Business and Vocational Education Conference, Valdosta State University, Valdosta, GA, April 18. Jacobs, J. (1996). Gender inequality and higher education. Annual Review of Sociology, 22, 153-185. Jamieson, D., & O'Mara, J. (1991). Managing workforce 2000: Gaining the diversity advantage. San Francisco: Jossey-Bass Publishers. Karp, K., & Shakeshaft, C. (1997).Restructuring schools to be math friendly to females. NASSP Bulletin, 81(586), 84-93. McCorduck, P., & Ramsey, N. (1996). The futures of women: Scenarios for the 21st century. New York: Addison-Wesley. Moskal, B. (1997, February 3). Women make better managers. Industry Week, 17-19. Naisbitt, J. (1982). Megatrends. New York: Warner Books, Inc.
Naisbitt, J. (1994). Global paradox. New York: Avon Books. Naisbitt, J., & Aburdene, P. (1990). Megatrends 2000. New York: William Morrow & Company, Inc.
National Center for Educational Statistics.(1994). Digest of Educational Statistics. Washington, DC: US Government. Printing Office. Nicholson, P. (1997, May). Women in the year 2020. The Futurist, 31(3), W7. Pilzer, P. (1990). Unlimited wealth. New York: Crown Publishing Group. Popcorn, F. (1992). The Popcorn Report: Faith Popcorn on the Future of Your Company, Your World, Your Life. New York: HarperBusiness. Popcorn, F., & Marigold, L. (1998). Clicking: 17 Trends That Drive Your Business -- And Your Life. New York: HarperBusiness. Ramos, I., & Lambating, J. (1996). Risk taking: Gender differences and educational opportunity. School Science & Mathematics, 96(2), 94-98. Rifkin, J. (1995). The end of work. New York: G. P. Putnam's Sons. Sperling, M. (1992). Applied economics: A program that actively involves students in learning. Social Studies, 83(4), 152-154. Steinem, G. (1997, September). Revving up for the next 25 years. Ms. Magazine, 8(2), 82-84. Thurow, L. (1996). The future of capitalism: How todays economic forces shape tomorrows world. New York: Penquin Books. Tichey, N., & Sherman, S. (1993). Control your destiny or someone else will. New York: HarperBusiness. Toffler, A. (1990). Powershift. New York: Bantam Books. Toffler, A.,& Toffler, H. (1995). Creating a new civilization. New York: Turner Publishing. Van Scotter, R., Van Dusen, L., & Worthen, B. (1996). Starting early: Junior Achievement's elementary school program. Educational Leadership, 53(8), 33-37. Witkin, H., Dyk, R., Faterson, H., Goodenough, D., & Karp, S. (1962). Psychological differentiation. New York: John Wiley. Witkin, H., Oltman, P., Raskin, E., & Karp, S. (1971). A manual for the Embedded Figures Tests. Palo Alto: Consulting Psychologists Press.